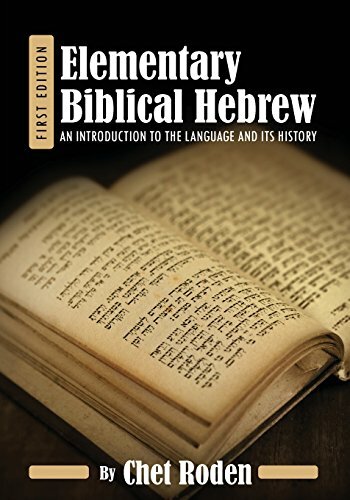 "Elementary Biblical Hebrew: An Introduction to the Language and its History gives students a general overview of the language and focuses on its main characteristics. While many standard textbooks assume that students plan to study the language academically and in-depth, Elementary Biblical Hebrew avoids a heavy-handed academic approach and instead emphasizes the basics of general understanding. Students are exposed to commentaries and word studies that provide a strong linguistic foundation while introducing Biblical Hebrew's primary components. Chapters include strategies and hints for learning the language, as well as activities and exercises that allow for application. Elementary Biblical Hebrew takes an ancient language and places it in an engaging, relevant context to make it come alive. The text is enriched with charts, illustrations, and full-color photography. Elementary Biblical Hebrew is an excellent choice for courses in the language, as well as introductory or survey courses on the Old Testament. Chet Roden holds a Ph.D. in Biblical studies and the Old Testament from Southeastern Baptist Theological Seminary. Dr. Roden is now an associate professor and chair of the Department of Biblical Studies at Liberty University School of Divinity. His writing has appeared in the Near East Archaeological Society Bulletin, the Midwestern Journal of Theology, and the Journal of the Evangelical Theological Society. In 2015 and 2016, Dr. Roden participated in archaeological field work, excavating water systems and exploring Iron Age gates and fortifications systems, at the Tel Gezer archaeological site in Israel." If you have any questions about this product by Cognella Academic Publishing, contact us by completing and submitting the form below. If you are looking for a specif part number, please include it with your message.